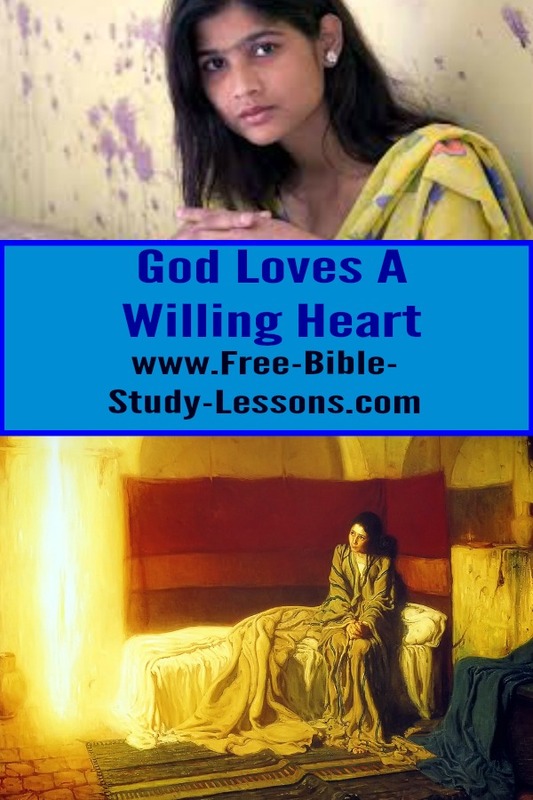 Mary was a poor young girl, probably a teenager, who loved God and had a willing heart. She knew the Scriptures. Like every Jewish girl she hoped she would be the mother of the Messiah, but girls and women had been hoping that for 4,000 years. What were the chances that she would be one? And then Gabriel appeared to her and told her she was the one. After Gabriel had reassured her, he explained what God wanted to do through her life. Mary was not naive nor did she allow emotion to control her. She considered what the angel had to say. She knew babies don’t happen by themselves. Her question was not one of doubt but of method. How was this going to happen? What did she have to do? God loves a willing heart. It is a beautiful thing before the Lord. Too often people are full of their own plans, their own desires, their own goals. The Kingdom of God takes a second place. Jesus said, “Seek first the Kingdom of God…” [Matt. 6:33]. Also notice that Mary avoided the traps of false humility and pride. She did not go around boasting that God chose her because of how great she was. [I suspect she would be horrified at how some religious organizations have almost deified her.] Neither did she moan and groan that she wasn’t worthy, she was just a poor girl, etc. She accepted the gift of God with grace and dignity knowing that it was an act of grace and high privilege. That was not Mary’s attitude nor is it the attitude of Christians who understand the ways of God. Mary felt that it was an honour to serve Someone greater than she was. It was a privilege to respond to His calling. She had the willing heart that God loves. She viewed herself at the command of the Lord. All He had to do was ask. Did you catch that? The Almighty God of the universe chose to ask a young girl if she would allow Him to carry out His purpose in her life! God asked! The plan of eternity, the revealing of the operation on which the salvation of human beings hung, the hope of the ages…and God asked if she would allow Him to work it through her life. God does not force Himself or His will on anyone. Mary considered, and gave her permission. What about you and I? God loves a willing heart. His work is not done. Salvation has been purchased, but the full effects of it are not felt on this planet. His Will is not being done completely on earth. The implementation of Christ’s victory is still in progress. God searches for the man or woman, the boy or girl who will yield their will to His to accomplish His purpose in their lives and expand His kingdom in the world. D.L. Moody said, “The world has yet to see what God will do through a person totally yielded to Him.” We did see it once…in Jesus Christ. I remember seeing an interview with Gladys Aylward [The Small Woman - a remarkable story] talking about when she was a lonely missionary in China. She prayed for a spouse and believed God answered. But nobody ever came. God called, but someone refused the call - he said ,”No” - …and missed the will of God and the opportunity of a lifetime. The greatest step in seeing the will of God fulfilled in your life and mine is to have a heart willing to let God move in it and have His way regardless of the cost. God loves a willing heart.